E Guijarro, C Santandreu Mascarell, L Canós Darós, R Díez Somavilla, E Babiloni Griñón (2018): “Multicriteria techniques applied to social media in public sector: the use of Twitter by different law enforcement authorities profiles”. Revista Latina de Comunicación Social, 73, pp. 1412 to 1427. Introduction: Currently, public organizations are promoting the use of social media as a communication tool for social marketing, in order to influence the behaviour of individuals to achieve social welfare. Methodology: The multi-criteria technique AHP (Analytical Hierarchical Process) has been applied to four Twitter profiles of law enforcement authorities from different territorial areas. Thus, the model has been represented as a hierarchy, the explanatory variables that explain the correct use of social media have been identified and grouped into clusters and both variables and clusters have been weighted using the judgment of a communication expert. Results: Among the clusters of explanatory variables used for the study, "C3. Impact of the profile" has been identified as the most important for the expert. As regards the variables, the most relevant is "Number of followers". On the other hand, the results show the effectiveness of Twitter profiles of the different law enforcement authorities analyzed as a communication tool. Conclusions: This work provides practical information, since it identifies which are the fundamental variables to obtain an efficient use in social media and reach the proposed goal of influencing individuals to achieve a common welfare. Furthermore, further research is opened to complement the results obtained. The purpose of social marketing is to influence the public’s voluntary behavior in order to contribute to the improvement of society. According to Andreasen (1995), social marketing makes use of commercial marketing techniques for the analysis, definition, execution and assessment of programs to promote social benefit. Kotler (2002) defines it as the use of principles and techniques to influence on a target audience so that it willingly accepts, rejects, modifies or abandons a behavior for the benefit of individuals, groups or the society in general. Recently, both that concept and its field of application have evolved, thus emerging different definitions and delimitations thereof. However, in the ‘World Social Marketing Conference 2014’, Philip Kotler uses one word to define it: welfare. The success of a social marketing program is measured according to its efficacy and pertinence (Hornik, 2001). In this sense, the communication of the message to be conveyed plays an essential role in the marketing strategy and it is especially relevant to correctly define the most efficacious and pertinent communication channels as a guarantee to reach the social goal of the message. In the current context, communication is, mostly of digital nature (Patrut, 2015), determined not only by the contents and users, but also existing technologies (Keïnanen and Kuvalainen, 2015). Internet has contributed to promote the use of online communication (Jayaram et al., 2015) while social networks have turned into a strategic communication platform (Guesagala, 2016) that has generated very interesting challenges for communication professionals: current messages must be creative, innovative and digitally consistent (Evans et al., 2011). The communication strategies of social marketing in networks aim to create real relationships with its target public (Hanna et al., 2011; Mangold and Faulds, 2009). In this sense, social networks offer organizations a unique tool to build and maintain relationships with its target public (Killian and McManus, 2015), provide the opportunity to stablish and promote the participation of users, conversation, collaboration and interaction as well as multilateral connections (McCann and Barlow, 2015) thus generating interrelations among public institutions and society (Yi Oh and Kim, 2013). Therefore, in this context it is very important to choose the most suitable social network properly and in this sense, Twitter seems to consolidate as the most used tool by organizations in their social marketing communication strategies, because it is perceived as a social mobilization network, that achieves a wide dissemination potential and virality that allows reaching a great majority of general public (Arroyo-Almaraz et al. 2018). In our context, we find examples of social marketing, essentially, in non-governmental organizations and, especially, in public organizations that ensure the improvement in any social area. In this sense, the fact of determining the target public and communication channels to reach said public, play a fundamental role in the success of the social marketing strategy (Andreasen, 2002). According to Waters and Jamal (2011) the main non-profit United States organizations use Twitter to send unidirectional messages which content basically is public information. Twitter allows users to write short messages (140 characters until November 7, 2017) that are constantly updated, therefore there is a communication in real time. Following this trend, Lovejoy and Saxton (2012) confirm that most of non-profit organizations opt for an informational function more than for a function of community creation or action. However, an unanswered question in literature is what an organization should do so that its Twitter messages are efficient, namely, that they reach more users susceptible of being an target audience of its social marketing and to achieve a greater impact. In this sense, it is noteworthy that even though a great number of public entities use Twitter as social communication route, there is a scarce development of formal documents that contribute to define and understand its adequate functioning. Therefore, it is necessary to recommend and develop analytical frameworks that allow to recognize success factors in the use of these technologies, mainly in terms of interaction and assessment from a citizen perspective (Rojas-Martín and Criado, 2015). Considering the aforesaid, the goal of this article is presenting a multicriteria model that analyzes the use of Twitter by four public entities, as well as the identification and assessment of said success factors when used to convey social marketing messages. To achieve this goal, we suggest using the discrete multicriteria technique AHP (Analytical Hierarchical Process) (Saaty, 1980) which allows obtaining the priorities associated to a group of alternatives in scenarios with multiple stakeholders and criteria (tangible and intangible). AHP has been used in many occasions for solving multicriteria problems about marketing (Mishra and Mishra, 2018), either for the analysis of the marketing strategy or any of its components (please see, for example, Min Hua Lu et al., 1994; Büyüközkan et al. 2016; Kord et al. 2016; Wu and Kao, 2017; Ahmad et al. 2017), or to study consumer’s behavior (Jain et al. 2015; Leung et al. 2016; among others). Nevertheless, as far as we know, the AHP has not been specifically applied to a problem framed within social marketing, making this paper pioneer in this field. The advantage of using AHP in a social marketing context is that it allows to include quantitative as well as qualitative variables in the same model. Thus, the activity performed by the selected profiles, as well as the impact of said activity in the rest of the community of Twitter users can be analyzed jointly. The fact is that, from a social marketing perspective, what it is really important is knowing whether the use of the social network is influencing in the society, therefore fulfilling its goal of social welfare. In order to do this, the model includes the judgment of an expert that not only assesses every profile analyzed, but also every variable, thus obtaining the most relevant variables. From the public entities using Twitter, this paper shows four profiles of the field of citizen safety since the use given to this social network limits exclusively to sending messages with a social marketing content, while other public entities also use it for public, tourism and even political marketing, thus escaping the aim of this study. Specifically, we analyze the profile of the National Police (@policia), Mossos de Esquadra (@mossos), London's Metropolitan Police (@metpoliceuk) and Europol (@europol_eu). The first step is defining the objective of this study case, which consists of determining what public entity best uses social networks to convey social marketing messages. In order to do this, it is necessary to gather all the necessary information of the study problem in such a way that it can be represented in the most complete manner, including all kinds of variables that could be relevant. This information must consider the context surrounding the problem, identify the explanatory variables, alternatives as well as stakeholders involved in the process to be able to select those that will be included in the model afterwards. In this step, we have consulted different sources with studies about the use of social networks (IAB, 2016; Saavedra et al., 2013) and, more specifically, their use by public entities (Criado and Rojas-Martín, 2015; Criado et al. 2017). The study of all this information allows to define not only the problem’s objective, but also two essential aspects: to determine what social network to be selected and what representative sample of the activity to be assessed. Among the different digital platforms available, we selected Twitter due to its open and participatory approach because it allows a broader content spreading as well as a greater facility to collect data. On the other hand, the fact that its communicative format is delimited to only 140 characters makes the analysis of its use interesting to confirm whether it is possible to convey messages of social nature, with a positive effect for the Public Administration, considering the writing area restrictions (Bernhardt et al., 2014). Once the problem was defined and the social network selected, the next step is to limit the temporal period of analysis. In this case, we analyzed six months, ranged from October 1, 2017 until March 31, 2018. We consider it is a sufficient period to avoid the effect on the result that an event of any kind that impacts public life may have and that leads to increase activity on Twitter. There are several tools that allow obtaining data about profiles activity on Twitter without being their owners. In this study we mainly use Twitonomy due to the great amount of information it presents and analyses. With this tool, the broader temporal period we could have access to was, precisely, of six months. It is important to clarify that many of the tools available to obtain information about profiles and their activity, delimit the search by number of tweets. However, in this study we use a default temporal period since the activity of every profile can be different and the fact of using only the quantitative criteria of the activity to select the sample can cause that different moments are analyzed, thus biasing the result. Within the scope of public entities, the field of study was delimited to law enforcement authorities, because it is precisely in this sector where social networks are mostly and almost exclusively used to convey social marketing messages. The goal of these messages is, as a matter of fact, to influence on citizens to achieve a social and general benefit. Specifically, we analyze four profiles that cover different territorial areas: National Police (@policia) countrywide, Mossos de Esquadra (@mossos) at regional level, London's Metropolitan Police (@metpoliceuk) at local level but with a similar range as the previous ones and Europol (@europol_eu) at European level. The next step is selecting the group of variables relevant for the proposed problem, namely, those features that explain good practices in the use of social networks as social marketing tool. Said explanatory variables have been selected by an expert in the field of communication in social networks and there are both quantitative and qualitative variables included. As a matter of fact, in order to include and quantify the latter we will use the AHP methodology, because other multicriteria techniques have the limitation of being valid only for quantitative variables. Once all explanatory variables have been selected, they are clustered by the relationship between them, forming groups with homogeneous variables between them and keeping the greatest heterogeneity possible between groups in such a way that clusters are independent between them. In this study we have selected a total of 22 variables grouped into 4 clusters. The first one includes variables related to the social and technological context. The second one gathers the explanatory variables of the entity. The third cluster includes all variables related to the activity of profiles on Twitter. And lastly, the last cluster includes the variables associated with the impact of that activity in the rest of the Twitter community. Please note that within this cluster there are two sub-clusters related to retweets and favorites received from other users. Table 1 summarizes this information indicating on the last column, in addition, the source of information used to obtain data of each variable for every profile. Table 1. Explanatory variables grouped into clusters and sources of information. Once the objective of the problem has been identified, alternatives and criteria are structured into a hierarchical tree. 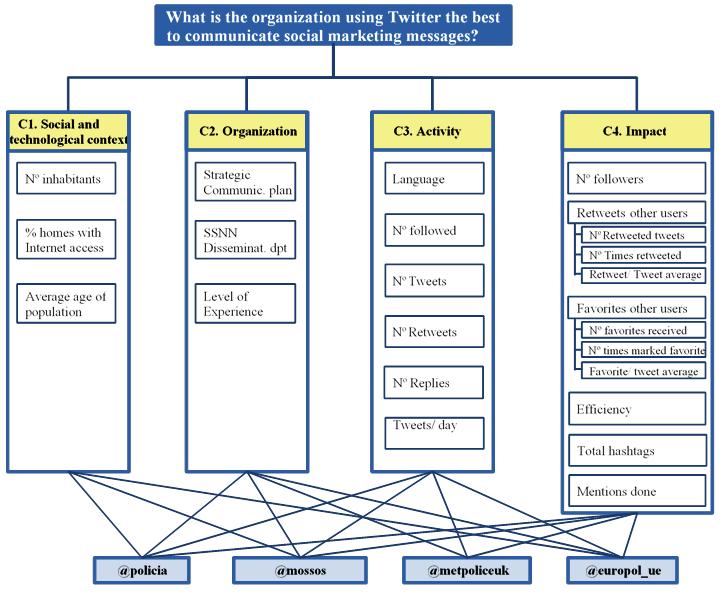 In this way, the superior node of the tree represents the problem’s objective (to determine what profile uses Twitter better as a social marketing communication tool), in the lower levels there are the alternatives (Twitter profiles) and, the intermediate levels are reserved for criteria and subcriteria (explanatory variables grouped into clusters) as represented in Figure 1. All elements of the hierarchy have a relation of unidirectional dependency in an ascending order from the lower level of the tree (leaves) to the upper node (root). In this step the assessment of the expert in communication and social networks is included. In order to do this, we use pairwise comparisons that allow to quantify the variables of qualitative nature and they are solved by using Saaty’s fundamental scale (see Table 2). Thus, in first place, the local priorities of alternatives and criteria may be obtained. Subsequently, local priorities are obtained by calculating the eigenvector, which evaluate the relative relevance that the expert grants to elements hanging from a common node compared to it; and global priorities, or priorities of elements regarding the objective of the problem. Lastly, by using an aggregation process of global priorities, the total priorities of the alternatives are obtained for the different pathways that connect them with the goal, to finally obtain the total weight of each one of the profiles analyzed. In the case of explanatory quantitative variables, they are incorporated directly in the assessment process through the calculation of the eigenvector by normalization of the values as percentages from the total. Criterion A is equally dominant compared to criterion B. Experience and judgement moderately favor criterion A over B. Experience and judgement strongly favor criterion A over B.
Criterion A is much more dominant than B. The greatest relevance of criterion A over B is unquestionable. Intermediate values in between the previous ones, when there is the need for nuance. Among AHP advantages there is the possibility of evaluating the consistency or inconsistency of the expert when issuing judgements by estimating the consistency index (Aguarón and Moreno-Jiménez, 2003; Saaty, 1980). This way, in those cases where an unacceptable inconsistency level is detected, the expert has the opportunity of modifying its initial judgements until overcoming this problem. There are several ways for detecting the inconsistency of a matrix and measuring the consistency of issued judgements. The method used in this study consists of estimating the consistency ratio (Saaty, 1980) defined as the quotient between the consistency index and the random consistency index, namely, it measures the relationship between the consistency reached by the studied matrix and the average consistency index that would be reached if a matrix of the same dimension was completed randomly using the values of Saaty’s fundamental scale. After completing every pairwise comparisons we obtain the priority vector , as a solution for the equation system , whereas is the greatest eigenvalue of matrix and is its corresponding eigenvector. In this study case and in order to facilitate the expert’s task, a series of questionnaires are presented by clusters (Figure 2) where he is requested to mark with an X how much relevant is the element on the left compared to the element on the right. This way, the expert does not quantify by using Saaty’s scale but simply by marking on the questionnaire instead. Later, the information indicated by the expert in the questionnaire is transferred to the pairwise comparison matrices, confirming the consistency index in each case. In those cases, where a consistency ratio exceeds the allowed ratio, the expert is requested to complete the questionnaire again, therefore eliminating inconsistencies. Once all eigenvectors were calculated, we proceed to aggregation to obtain the final weight of every alternative, as well as the weight that each explanatory variable has in the problem according to expert’s judgement. One of the great advantages about using AHP as multicriteria decision tool is that it does not only allow to identify what the best alternative is, but also what is the relative relevance each explanatory variable has inside its corresponding cluster and every cluster within the problem. In addition, it is noteworthy that this information is determined by the judgement of an expert in the field of communication through social networks. On table 4, we present the weight of each cluster. We can see how the most relevant cluster according to the expert is the cluster of variables related to "C3. Account’s impact", because in the communication of social marketing messages it is not only important to launch the message, but also that it reaches citizens, therefore generating an impact and a reaction by the rest of users through retweets, mentions, etc. However, the profile’s activity is also relevant, because in order to have an impact messages should be issued, therefore, the second most relevant cluster is "C2. Activity", followed by "C1. Context" and "C2. Organization." In the variables dimension (Table 5), the most relevant in the model is “Number of followers” with a global weight of 33%, followed by "Number of retweets received " (12.13%) and by "Efficiency" (11.49%). By analyzing these variables within each cluster, we observe that the most relevant variable by far in "C1. Social and technological context" is "Average age of population" (with a weight of 75.14%), which is directly related to the public target of social marketing messages and the dissemination channel used, which is social networks in this case. Nevertheless, this variable barely has a weight of 4.73% in the model in its entirety. On its part, the most relevant variable in the cluster "C2. Organization" is the presence of a "Strategic communication plan" where the strategies and guidelines to be followed by the organization in the use of Twitter as a social message communication tool are established. However, and as happened in the previous case, the global weight of this variable is 4.23% from the total. In the cluster related to "C3. 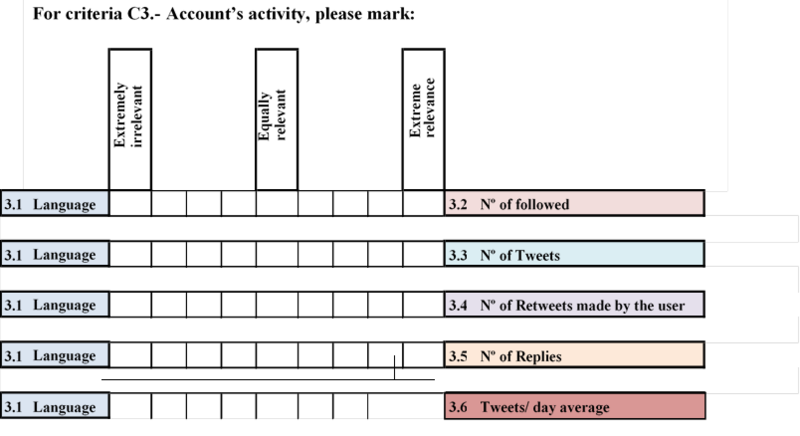 Account’s activity", the most relevant explanatory variable is "Average of daily tweets" made by the profile, which indicates that it is advisable to use social networks steadily in order to have an impact in the community of users, instead of an erratic use where some days a lot of information is published while in others, the activity is much less. On the other hand, the “Number of tweets” and “Responses made by the profile” are also relevant variables since they are clear indicators of the account’s activity as well as its relationship with followers and other users. Lastly, in the cluster "C4. Account’s impact", the most important variable is the "Number of followers" (45.64%) followed by the "Number of retweets received" (16.88%) and "Efficiency" (15.99%), because as already indicated, these variables provide information about the interest generated about the information published by the profile and its impact in the rest of the community of users. Adding the previous results together with the weight of every alternative, we obtain the global weigh of every profile analyzed, an information shown on Table 6. In the table we see that the first place is occupied by the National Police, followed by London's Metropolitan Police, Mossos de Esquadra and Europol, respectively. This result supports the good practices of the National Police regarding communication through social networks. In fact, it is not only positioned first, but the relevance resulting from the application of the model is remarkedly higher than the rest (45.37%). Table 7 presents the weight vector of every profile for each one of the twenty-two explanatory variables. When analyzing these data, it is interesting to note that the National Police is precisely the only one of the four profiles analyzed that doesn’t follow anyone on Twitter (Table 7(b)). However, this doesn’t influence in its capacity for impacting on the community of users. In fact, data show that, it is not only a profile of high activity on the social network, but in addition, the impact of its messages is quite high, as shown by data of retweets and received favorites (Table 7(c)(d)). In this paper we use the AHP methodology in order to analyze the use of social networks to communicate social marketing messages by four public entities, specifically, law enforcement authorities. Besides noticing that the profile of the National Police is the one obtaining a remarkedly higher weight than the rest, this study contributes with information of great relevance and practical usefulness. The results of this research allow to identify the most relevant variables when it comes to an efficient use of social networks for this purpose in such a way that the individuals responsible for the communication of social marketing messages from other public entities can use these results to define an efficient strategy that achieves, precisely, the goal established: to influence on citizens to achieve social welfare. We suggest, basically, two future work lines: on the one hand, to continue with this study but using the ‘Analytic Network Process’ (ANP) developed by Saaty (1996) and that, like the AHP methodology used herein, it pursues a prioritization of alternatives from pairwise comparisons between the model’s elements. However, with ANP a much more complex and realistic model is constructed compared to the pure hierarchical structure of the AHP model, since it incorporates the potential interdependency and feedback between the different elements that compose it. This way, the decision problems are much closer to reality because it includes the interactions produced between the elements of the problem as well as between the agents of the context. On the other hand, it is considered very interesting to broaden and complete this study, performed from a more quantitative perspective, with a qualitative analysis of messages issued by these profiles, considering the qualitative research helps to moderate online communities. Said research would contribute with more information to identify the pragmatic plan (who talks and from what context) and, especially, the semantic plane (what is the message conveying, what is the goal) that allows to distinguish relevant information. Ahmad, F.; Khan, A.A.; Baig, M.M. (2017). Weighting of Marketing Mix elements using fuzzy Analytic Hierarchy Process and Area Based Ranking on Fuzzy Numbers. NED University Journal of Research-Applied Sciences, vol. XIV, no. 2, pp. 35. Aguaron, J.; Moreno-Jiménez, J.M. (2003). The geometric consistency index: Approximated thresholds. European Journal of Operational rResearch, vol. 147, no.1, pp. 137-145. Andreasen, A. (1995). Marketing Social Change: Changing Behaviour to promote Health, Social Development and the Environment. San Francisco: Jossey-Bass Publishers. Andreasen, A.R. (2002). Marketing in the Social Change Marketplace. Journal of Public Policy and Marketing, vol 21, no. 1, pp. 3-13. Arroyo-Almaraz, I.M. ; Calle Mendoza, S.; Van Wyk, C. (2018). La eficacia en la comunicación de las ONGD. El uso de Facebook en campañas de emergencia. Revista Latina de Comunicación Social, 73, 765-789. Bernhardt, J. M., Alber, J., Gold, R. S. (2014). "A social media primer for professionals: digital dos and don’ts". Health promotion practice, 15(2), 168-172. Büyüközkan, G.; Mukul, E.; Uztürk, D. (2016). Marketing strategy selection for logistic companies. XIV International Logistics and Supply Chain Congress, December, Izmir (Turquía), pp. 437-445. Criado, J.I. ; Rojas-Martín, F. (2015). Estrategias y realidades en la difusión de las redes sociales en las administraciones públicas. Análisis desde una perspectiva institucionalista. Innovar: Revista de ciencias administrativas y sociales, vol. 25, no. 57, pp. 45-62. Criado, J.I. ; Rojas-Martín, F.; Gil-García, J.R. (2017). Enacting social media success in local public administrations: An empirical analysis of organizational, institutional, and contextual factors. International Journal of Public Sector Management, vol. 30, no. 1, pp. 31-47. Evans, A.; Twormey, J.; Talan, S. (2011). Twitter as a Public Relations Tool. Public Relations Journal, 5(1), Winter. Guesalaga, R. (2016). The use of social media in sales: Individual and organizational antecedents, and the role of customer engagement in social media. Industrial Marketing Management, 54, 71-79. Hanna, R.; Rohm, A.; Crittenden, V.L. (2011). We’re all connected: The power of the social media ecosystem. Business Horizons, 54, 265-273. Hornik, R. (2001). Remarks on the Ocassion of the Andreasen Fellowship Lecture. Social Marketing and Health Conference (22 June). Clearwater. Interactive Advertising Bureau (IAB) (2016). "VII Estudio anual redes sociales de IAB Spain", Madrid: iabspain. Jain, A.; Kumar, A.; Kumar Dash, M. (2015). Information technology revolution and transition marketing strategies of political parties: analysis through AHP. International Journal of Business Information Systems, vol. 20, issue 1. Jayaram, D.; Manrai, A.K. ; Manrai, L.A. (2015). Effective use of marketing technology in Eastern Europe: Web analytics, social media, customer analytics, digital campaigns and mobile applications. Journal of Economics, Finance and Administrative Science, 20, 118-132. Keinänen, H.; Kuivalainen, O. (2015). Antecedents of social media B2B use in industrial marketing context: customers’ view. Journal of Business & Industrial Marketing, 30(6), 711-722. Killian, G.; McManus, K. (2015). A marketing communications approach for the digital era: Managerial guidelines for social media integration. Business Horizons, 58, 539-549. Kord, B.; Heidari, Z.; Rigi, F. (2016). Identification, and ranking of marketing strategies in handicraft industries of Fars province Iran with AHP attitude. IIOABJ, vol. 7, 1, pp. 397-404. Kotler, P.; Roberto, N.; Lee, N. (2002). Social Marketing: Strategies for Changing Public Behaviour. Thousand Oaks: Sage Publications. Leung, P.P.L. ; Wu, C.H. ; Ip, W.H. ; Ho, G.T.S. ; Cho, V.W.S. ; Kwong, K.K.Y. (2016). Customer loyalty enhancement of online-tooffline marketing in beauty industry. 4th International Conference on Enterprise Systems (ES), November, Melbourne (Australia). Lovejoy, K.; Saxton, G.D. (2012). Information, Community, and Action: How Nonprofit Organizations Use Social Media. Journal of Computer-Mediated Communication, 17, 337-353. Mangold, W.G. ; Faulds, D.J. (2009). Social media: The new hybrid element of the promotion mix. Business Horizons, 52, 357-365. McCann, M.; Barlow, A. (2015). Use and measurement for social media in SMEs. Journal of Small Business and Enterprise Development, 22(2), 273-287. Min Hua Lu, C.N. ; Madu, C.K. ; Dena, W. (1994). Integrating QDF, AHP y Benchmarking en marketing strategic. Journal of Business & Industrial Marketing, vol. 9, issue 1, pp. 41-50. Mishra, R.; Mishra, O.N. (2018). A hybrid PCA-AHP-Multi-Grade Fuzzy approach to assess marketing-based flexibility. Marketing intelligence & Planning, vol. 36, issue 2, pp. 213-229. Patrut, M. (2015). Candidates in the presidential elections in Romania (2014): The use of social media in political marketing. Studies and Scientific Researches. Economics Edition No. 21. Rojas-Martín, F.; Criado, J.I. (2015). Avanzando en la medición de las redes sociales digitales: una propuesta para su análisis desde una perspectiva institucionalista. Revista de Gestión Pública, vol. Iv, no. 1, pp. 46-64. Saaty, T. (1980). The Analytic Hierarchy Process. Pittsburgh: RWS Publications. Saavedra, F.U. ; Rialp Criado, J.; Llonch Andreu, J. (2013). El uso de las redes sociales digitales como herramienta de marketing en el desempeño empresarial. Cuadernos de Administración, vol. 26, no. 47, pp. 205-231. Waters, R.D. ; Jamal, J.Y. (2011). Tuit, tuit, tuit: A content analysis of nonprofit organizations’ Twitter updates. Public Relations Review, 7, 321-324. Wu, C.J. ; Kao, H. (2017). The marketing project selection using AHP and 0-1 goal programming model. Transylvanian Review, vol. XXV, no. 16. Yi, M.; Oh, S.; Kim, S. (2013). Comparison of social media use for the U.S an the Korean Governments. Government Information Quarterly, 310-317. Article received on 7 May 2018. Accepted on 18 October. Published on 4 November 2018.